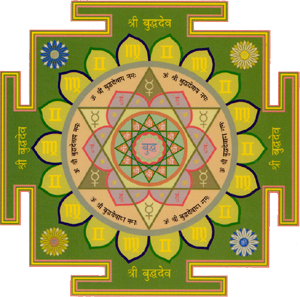 There is much to be said about yantras, Vastu yantras are discussed in more detail in other posts. Here are some basic bullet points mentioning their main mode of operation. Each yantra offers its own unique benediction, and there are as many types, as there are various desires. It is safe to say they may number in hundreds if not more. Yantra literally means ‘instrument’ or ‘tool’ that especially ‘holds’ the essence of a concept, and helps your mind to ‘fasten’ on a particular idea and intention. They are used as remedial tools and work in mystical ways, offering us a opportunity for transforming negative traits into positive outcomes. A Yantra is great cosmic conductor of energy, an antenna of Nature, and powerful device used since days of yore to invoke harmony, prosperity, success, good health as well as is conducive for yoga and meditation. The mother of all Yantras is the Sri Yantra. They serve to reveal symbols of our own inner cosmic truths and can act as portals to higher dimensions. They are the microcosm representation of the macrocosm of the universe, serving to align our way of being with the powerful natural cosmic energy flow or with the personality or deity, the particular yantra represents. In looking at a yantra, it is comprised of interlocking matrix of geometric figures, circles, triangles and floral patterns of elegance and beauty which the eyes and mind can concentrate upon to achieve higher levels of consciousness. 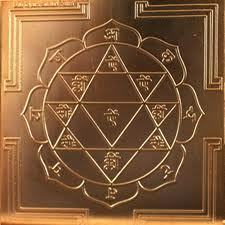 They are most commonly available in copper, and if you have the means, silver and gold yantras can also be commissioned. Yantras can also be drawn and written on paper. In ceremonies and festivals they are drawn with different coloured pigments onto the earth, like mandalas for immediate use for attracting auspicious energies. If you are not familiar with yantra then perhaps a talisman would be the nearest description to fit it. 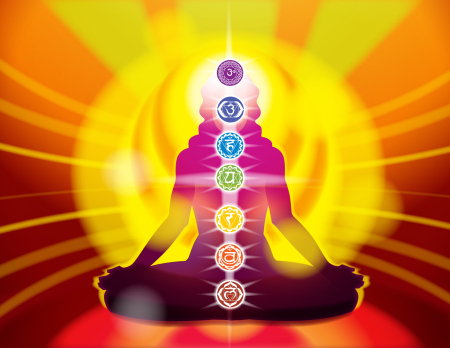 Recent scientific research has proved that yantras and mantras can raise your level of positive vibrations and uplift your consciousness.